Trump Continues Attempt To Divert From Flynn Scandal - Joe.My.God. Despite his disdain for anonymous sources, Trump jumped on the story — provided by an unidentified Congressional source — in his fifth and sixth tweets of the day. 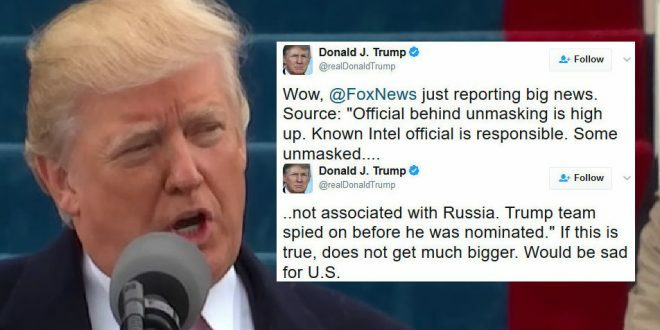 Trump — as he has done since accusing the Obama administration of wiretapping Trump Tower — produced no evidence or corroboration of the Fox report. Earlier in the morning, he blasted media coverage of the Russian probes currently underway in both the House and the Senate. The FBI is also conducting a counterintelligence investigation into Russian interference during the 2016 presidential campaign. Wow, @FoxNews just reporting big news. Source: “Official behind unmasking is high up. Known Intel official is responsible. Some unmasked…. ..not associated with Russia. Trump team spied on before he was nominated.” If this is true, does not get much bigger. Would be sad for U.S.